* It is loud and projects strongly – but it’s not as overbearing as the shower gel can be. That’s not saying it’s weak or anything – it’s just not AS strong as it could be. * Wait, I take that back. After five minutes it gets stronger. Okay, here comes the cotton candy attack with bubble gum and vanilla as supporting players. Imagine floating in clouds of cotton candy . It feels like you are enveloped in it. * While it is quite linear, there is a bit of melon that wafts in from time to time. * The sweetness stays present even when it dries down to a sweet vanilla musk and becomes a skin scent. 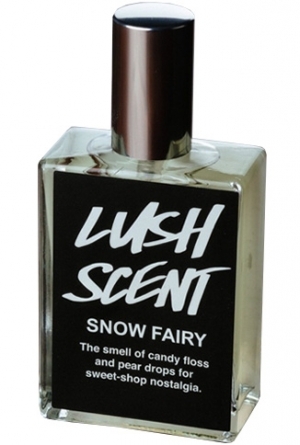 Summary: I am a huge fan of Lush Snow Fairy Shower Gel, so when I hear they were releasing the pure perfume version, I ordered it the first day. The perfume is faithful to the shower gel and will bring a smile to your face. Spray some on and your spirit is instantly lifted. With the strong projection and silage, this isn’t office-friendly and I couldn’t imagine wanting to smell like cotton candy in the office anyhow. Longevity is really good – between 8 and 12 hours when I wear it. Since the shower gel is colored pink, this is obviously aimed feminine, but it definitely smells great on the right guy as well. Lush Scent Snow Fairy is a limited edition that was available only from their website. Check there first to see if it is still available. If not, ebay is pretty much your only option.